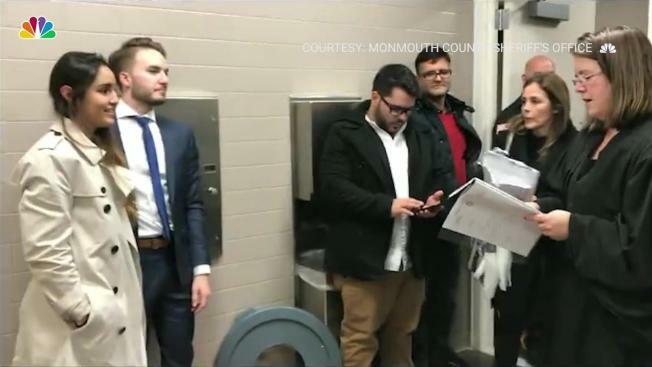 A New Jersey couple changed their wedding venue from a judge's chambers to a courthouse bathroom when the groom's mother had an asthma attack, a highly unusual, but memorable ceremony captured on video in the ladies' room. Brian and Maria Schulz were set to tie the knot when Brian Schulz's mother had difficulty breathing. She was taken to a women's room at the Monmouth County Courthouse, where sheriff's officers administered oxygen and called EMT's. If the couple had postponed the wedding, they would have had to wait 45 days for a new marriage license. So one of the officers suggested holding the ceremony in the bathroom. In a video posted on the sheriff's office Facebook page Wednesday, Judge Katie Gummer performed the "rather unusual" ceremony, the post said. "We are pleased to report that Mr. and Mrs. Schulz are doing great and so is mom," the Facebook post said. "They were touched that Sheriff’s Officers and the Hon. Judge Gummer went out of the way to make their day memorable and special."